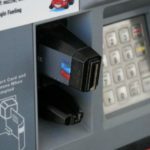 Three credit card skimmers have been discovered at gas pumps at a North Austin convenience store. The skimmers are used to steal information from the magnetic strip on customers’ credit cards. The fuel pumps with the credit card skimmers are now tagged as ‘out of order’ and the skimmers were removed by Austin Police. On Wednesday, the Texas Department of Agriculture (TDA) released several pictures of the three skimmers. 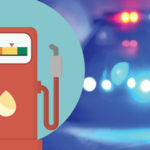 TDA looks for illegal credit card skimmers as part of their routine inspections of over 400,000 Texas fuel pumps. Officials say the convenience store was unaware the skimmers had been attached to the pumps and the 7-Eleven store is not part of the investigation into the illegal activity. A 7-Eleven employee says the owner and manager of the North Austin convenience store and gas station do daily inspections of the pumps and are working to stop the skimming problem. But it only takes a few minutes to attach a credit card skimmer to a pump if a thief has a key to open it. TDA says customers should be aware of the problem and avoid using pumps with credit card scanners that look unusual or appear to have been tampered with. To make a complaint about a fuel pump contact TDA at 800-TELL-TDA.